For those of you who’ve been following my fishy exploits for the best part of two years now, you’ll have undoubtedly realised that my hankering to revisit the seaborne exploits of my youth, has been all important to me. My love of the sea and the bounty that it yields has resided in me simmering away, for some thirty years and when graciously presented with the chance to do something about it, I’ve not thought twice and I now find myself with the tools and desire to see the job through. 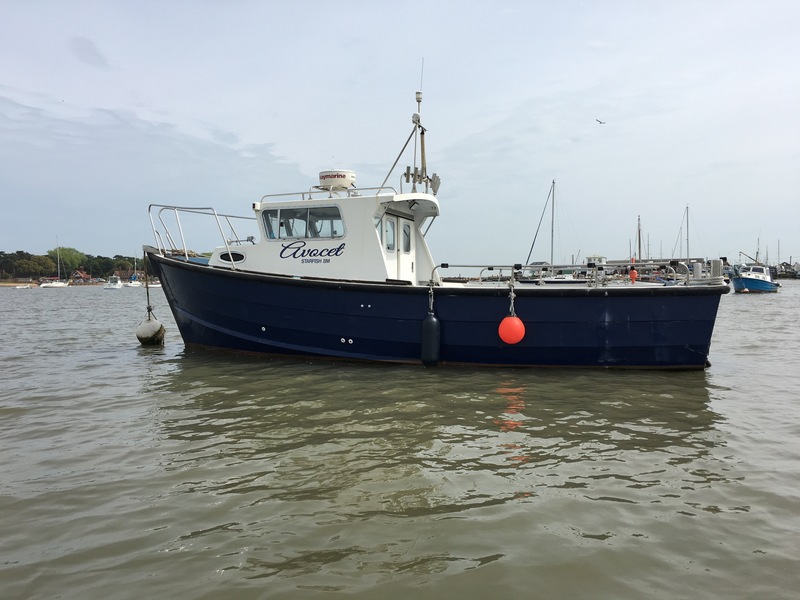 It all began with the rather protracted but necessary purchase of my boat “Avocet” an 8 metre “Starfish” work boat designed by Hugh Easton and built by Bounty Boats in Norfolk. I say protracted, as her previous owner was a reluctant seller and the negotiations, although drawn out, were thorough and important. He was at pains to have me take delivery in A1 condition and no stone was left unturned in ensuring she was in tip-top shape and ultra-seaworthy. 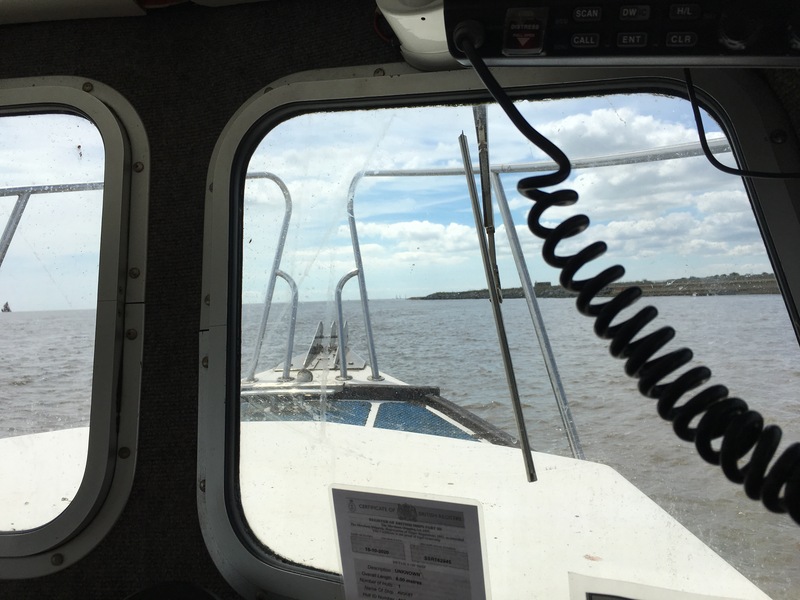 So, having acquired her last year, I took the decision to move her from her pontoon at Lowestoft to a swinging mooring at my beloved Felixstowe Ferry on the Deben estuary in Suffolk, where she now resides. A move that fate undoubtedly played a cunning hand in, especially in the light of my article Back To The Future which paved the way for me. With huge assistance from Ferry fishermen the Butters brothers (Ed & Rob) and the East Runton (Cromer) crab fishing Bywater family, I’ve managed to equip myself with enough local knowledge and gear to start my own forays to the lobster grounds, that played host to so many boyhood escapades. It’s a big deal for me, it really is and although I’ll derive immense satisfaction from the whole process, there’s an alterior motive. For as a writer, no matter how passionate and misty-eyed I get about the subject, no matter how much technical knowledge I amass and despite the countless conversations with willing and divulging fishermen, there really is no substitute for practicing what you preach. Of course I’m a willing participant, but I’ve figured, that if I can glean first hand, the experience and sensation of what these guys actually go through on a daily basis, (albeit on a massively diminutive scale) it’ll only serve me better, to describe and portray what actually happens afloat in the timeless quest for the fruits of our seas. 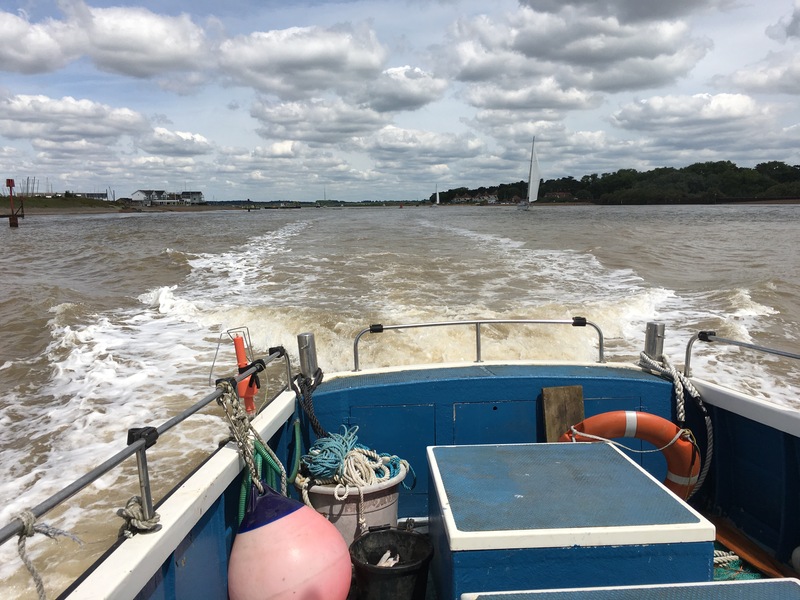 So armed with pots and tows, willingly and generously donated by Simon and David Bywater and bait (salted herring) from Ed and Rob, last week I rowed the gear to Avocet, started her engine, dropped the mooring and made to sea, taking care to avoid the shoaling ground of the Deben Knolls and abide by the buoyage marking the channel. Having been advised by Ed to keep to the grounds the Felixstowe side of the river -to evade the impending wind-farm survey, I steamed the short distance to an area we used to know as Reed Pond, noted for lobster, and proceeded to drop the first four of my twelve pots, as singles, each marked with an orange buff. Feeling very smug and self-satisfied, I returned to my mooring only to be chastised over the radio for entering the moorings a little quick (I’m still not quite used to 180hp), however, notwithstanding my indiscretion, I moored successfully and rowed ashore, only to be then gently informed by Rob that on steaming out earlier, I’d actually passed a buoy on the wrong beam and cut across the Knolls. Oops! Lucky for me it was nearly High Water……. Anyway, undeterred and having now been suitably and accurately informed, two days later and with a kindly forecast, I picked up some more bait from the hugely supportive Chris Wightman and sallied forth once more, to haul the gear with an adrenalin-fuelled anticipation of what might be lurking within. Important to point out at this juncture, it’s not just a case of sticking the pots anywhere in the water and hoping for the best. The floors, nets and eyes must be properly maintained and repaired, lest the quarry seeks an early escape. The bait must be of the right quality and replenished regularly and of course, then fished on the right ground. So the moment had arrived. Would my markers still be there? Would a passing vessel have unwittingly cleaved the buffs off with their prop? Would the buoys be running under with the tide? As I approached the area I scanned the sea keenly for anything orange. I picked up on one of Ed’s dahns and using that as a marker then proceeded to turn seawards and my first buff appeared. Then approaching into the tide I got the buoy alongside to starboard, knocked Avocet out of gear and fished the buff aboard with my boathook. Hauling in the slippery tow and spooling it onto my boots reminded me of the safety awareness constantly demanded of fishermen to avoid disaster at sea. Important to to be dressed appropriately too, my oilskins bearing the brunt of the water coming aboard as I hauled away. I felt the pot come away from the seabed and instantly my back took up the strain as the fathoms lessened. Hand over hand, the boat now rocking on the high water “bubble” as Dad used to call it, the pot slowly came up below the gunwales until I could see the spinner and leaning over, with sweat now obscuring my vision, I grabbed the frame and triumphantly brought the 38inch parlour aboard with an excitement I’ve not felt in many, many years. The pot in both hands now, I swung it 180 degrees to place it atop the engine box, which on Avocet sits at a very handy height. The process had me distracted somewhat, as I was so keen to get it aboard safely and with no damage to me, the boat, or the pot, but old habits die hard and the whole motion seemed remarkably fluid, even though not practiced in three decades. I then spied it. The gorgeous and telltale blue/black spectrum of my prize. A flap and flick of her tail revealed the white of her underside and my heart leapt. I’d done it, first pot and the culmination of months of thought, planning and deliberation. 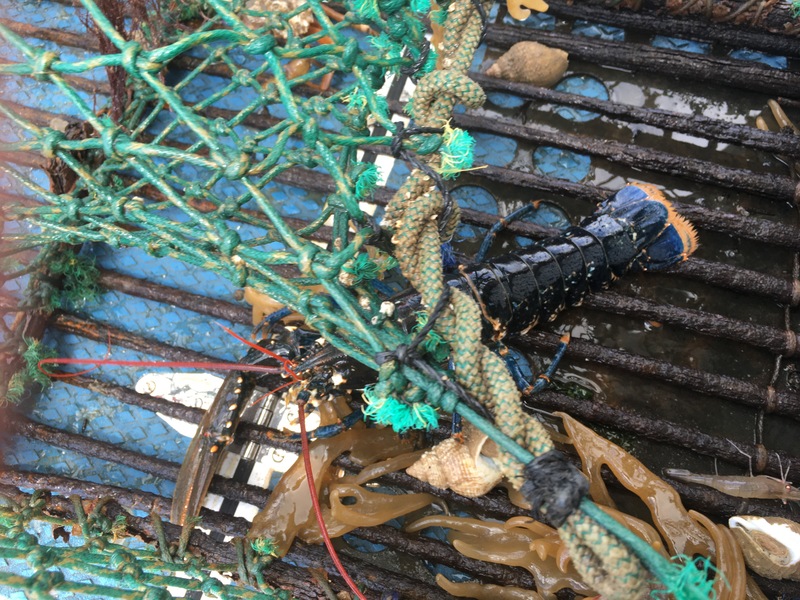 A lobster, a beautiful and special specimen that although at 80mm (under the Minimum Landing Size of 87m from the eye socket to the end of the carapace) not a keeper, nonetheless the only confirmation I needed, that the pots were fishing correctly and more to the point in the right place. Job done. 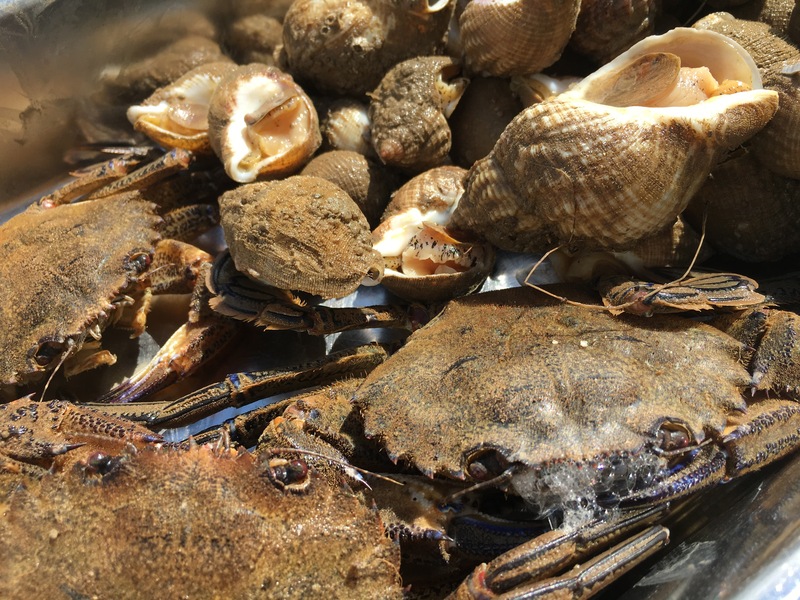 The other three pots I hauled and re-shot in the same manner and yielded another “Nancy” (undersized lobster) three lovely Velvet crabs and a good feed of a couple of kilos of whelks. 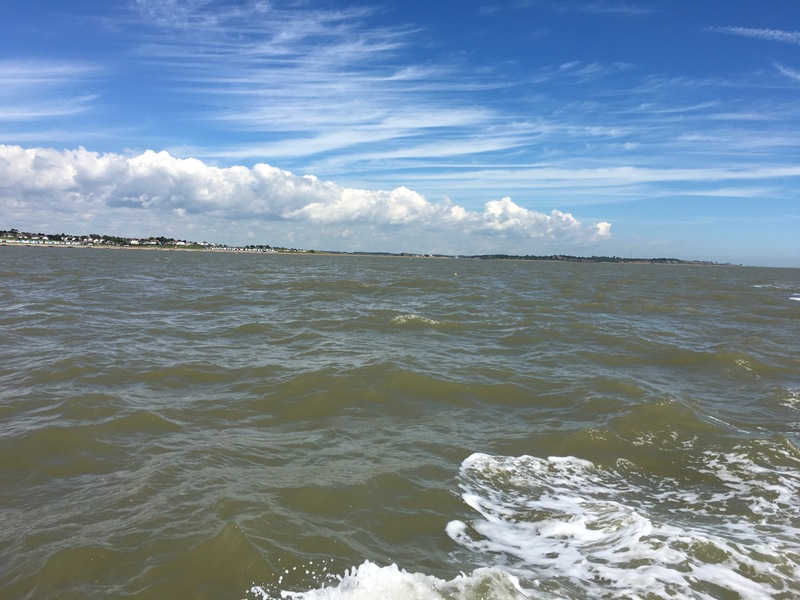 Satisfaction must have traced every part of my face as I turned for home and headed back towards the Woodbridge Haven buoy and the mouth of the river. As I steamed to mooring amidgst both yachts and other fishing boats, I truly felt I’d come home. An indescribably emotional moment and call it a midlife crisis or whatever you like, it felt so good and so right and I know full well, that my Father and Dougie were aboard and looking over my shoulder – no doubt with a smile and a wink to each other. In fact, as I rowed back later to the little beach at the boatyard, I passed a dinghy on what was Dougie’s old mooring, with a large and particularly handsome herring gull perched on the transom. As I glided past, its eyes followed me, as if observing intently, my passage. As I left it astern it got to its feet, threw its head back and creaked and kewed in a cacophonous outburst that only herring gulls can manage. I have never forgotten what my father told me about herring gulls and whom they represent…..
That’s very kind of you. It’s a lot of fun. I’m sure you will!